World-systems theory (also known as world-systems analysis or the world-systems perspective) is a multidisciplinary, macro-scale approach to world history and social change which emphasizes the world-system (and not nation states) as the primary (but not exclusive) unit of social analysis. "World-system" refers to the inter-regional and transnational division of labor, which divides the world into core countries, semi-periphery countries, and the periphery countries. Core countries focus on higher skill, capital-intensive production, and the rest of the world focuses on low-skill, labor-intensive production and extraction of raw materials. This constantly reinforces the dominance of the core countries. Nonetheless, the system has dynamic characteristics, in part as a result of revolutions in transport technology, and individual states can gain or lose their core (semi-periphery, periphery) status over time. This structure is unified by the division of labour. It is a world-economy rooted in a capitalist economy. For a time, certain countries become the world hegemon; during the last few centuries, as the world-system has extended geographically and intensified economically, this status has passed from the Netherlands, to the United Kingdom and (most recently) to the United States. A world map of countries by trading status, late 20th century, using the world system differentiation into core countries (blue), semi-periphery countries (purple) and periphery countries (red). Based on the list in Dunn, Kawana, Brewer (2000). Though other commentators refer to Wallerstein's project as world-systems "theory", he consistently rejects that term. For Wallerstein, world-systems analysis is a mode of analysis that aims to transcend the structures of knowledge inherited from the 19th century, especially the definition of capitalism, the divisions within the social sciences, and those between the social sciences and history. For Wallerstein, then, world-systems analysis is a "knowledge movement" that seeks to discern the "totality of what has been paraded under the labels of the... human sciences and indeed well beyond". "We must invent a new language," Wallerstein insists, to transcend the illusions of the "three supposedly distinctive arenas" of society, economy and politics. The trinitarian structure of knowledge is grounded in another, even grander, modernist architecture, the distinction of biophysical worlds (including those within bodies) from social ones: "One question, therefore, is whether we will be able to justify something called social science in the twenty-first century as a separate sphere of knowledge." Many other scholars have contributed significant work in this "knowledge movement". World-systems thinkers include Samir Amin, Giovanni Arrighi, Andre Gunder Frank, and Immanuel Wallerstein, with major contributions by Christopher Chase-Dunn, Beverly Silver, Volker Bornschier, Janet Abu Lughod, Thomas D. Hall, Kunibert Raffer, Theotonio dos Santos, Dale Tomich, Jason W. Moore and others. In sociology, a primary alternative perspective is World Polity Theory, as formulated by John W. Meyer. Dependency and world system theory propose that the poverty and backwardness of poor countries are caused by their peripheral position in the international division of labor. Since the capitalist world system evolved, the distinction between the central and the peripheral nations has grown and diverged. In recognizing a tripartite pattern in division of labor, world-systems analysis criticized dependency theory with its bimodal system of only cores and peripheries. Military dominance is also likely after a nation reaches these three rankings. However, it has been posited that throughout the modern world system, no nation has been able to use its military to gain economic dominance. Each of the past dominant nations became dominant with fairly small levels of military spending and began to lose economic dominance with military expansion later on. Historically, cores were found in Northwestern Europe (England, France, Netherlands) but were later in other parts of the world (such as the United States, Canada, and Australia). Semi-peripheries can come into existence from developing peripheries and declining cores. Historically, two examples of semiperipheral nations would be Spain and Portugal, which fell from their early core positions but still managed to retain influence in Latin America. Those countries imported silver and gold from their American colonies but then had to use it to pay for manufactured goods from core countries such as England and France. In the 20th century, nations like the "settler colonies" of Australia, Canada and New Zealand had a semiperipheral status. In the 21st century, nations like Brazil, Russia, India, Israel, China, South Korea and South Africa (BRICS) are usually considered semiperipheral. In the 19th century, Britain replaced the Netherlands as the hegemon. As a result of the new British dominance, the world system became relatively stable again during the 19th century. The British began to expand globally, with many colonies in the New World, Africa, and Asia. The colonial system began to place a strain on the British military and, along with other factors, led to an economic decline. Again there was a great deal of core conflict after the British lost their clear dominance. This time it was Germany, and later Italy and Japan that provided the new threat. Industrialization was another ongoing process during British dominance, resulting in the diminishing importance of the agricultural sector. In the 18th century, Britain was Europe's leading industrial and agricultural producer; by 1900, only 10% of England's population was working in the agricultural sector. By 1900, the modern world system appeared very different from that of a century earlier in that most of the periphery societies had already been colonised by one of the older core nations. In 1800, the old European core claimed 35% of the world's territory, but by 1914, it claimed 85% of the world's territory, with the Scramble for Africa closing out the imperial era. If a core nation wanted periphery areas to exploit as had done the Dutch and British, these periphery areas had to be taken from another core nation, which the US did by way of the Spanish–American War, and Germany, and then Japan and Italy, attempted to do in the leadup to World War II. The modern world system was thus geographically global, and even the most remote regions of the world had all been integrated into the global economy. As countries vied for core status, so did the United States. The American Civil War led to more power for the Northern industrial elites, who were now better able to pressure the government for policies helping industrial expansion. Like the Dutch bankers, British bankers were putting more investment toward the United States. The US had a small military budget compared to other industrial nations at the time. The US began to take the place of the British as a new dominant nation after World War I. With Japan and Europe in ruins after World War II, the US was able to dominate the modern world system more than any other country in history, while the USSR and to a lesser extent China were viewed as primary threats. At its height, US economic reach accounted for over half of the world's industrial production, owned two thirds of the gold reserves in the world and supplied one third of the world's exports. However, since the end of the Cold War, the future of US hegemony has been questioned by some scholars, as its hegemonic position has been in decline for a few decades. By the end of the 20th century, the core of the wealthy industrialized countries was composed of Western Europe, the United States, Japan and a rather limited selection of other countries. The semiperiphery was typically composed of independent states that had not achieved Western levels of influence, while poor former colonies of the West formed most of the periphery. World-systems theory has attracted criticisms from its rivals; notably for being too focused on economy and not enough on culture and for being too core-centric and state-centric. William I. Robinson has criticized world-systems theory for its nation-state centrism, state-structuralist approach, and its inability to conceptualize the rise of globalization. Robinson suggests that world-systems theory doesn't account for emerging transnational social forces and the relationships forged between them and global institutions serving their interests. These forces operate on a global, rather than state system and cannot be understood by Wallerstein's nation-centered approach. One of the fundamental conceptual problems of the world-system theory is that the assumptions that define its actual conceptual units are social systems. The assumptions, which define them, need to be examined as well as how they are related to each other and how one changes into another. The essential argument of the world-system theory is that in the 16th century a capitalist world economy developed, which could be described as a world system. The following is a theoretical critique concerned with the basic claims of world-system theory: "There are today no socialist systems in the world-economy any more than there are feudal systems because there is only one world system. It is a world-economy and it is by definition capitalist in form." Robert Brenner has pointed out that the prioritization of the world market means the neglect of local class structures and class struggles: "They fail to take into account either the way in which these class structures themselves emerge as the outcome of class struggles whose results are incomprehensible in terms merely of market forces." Another criticism is that of reductionism made by Theda Skocpol: she believes the interstate system is far from being a simple superstructure of the capitalist world economy: "The international states system as a transnational structure of military competition was not originally created by capitalism. Throughout modern world history, it represents an analytically autonomous level [... of] world capitalism, but [is] not reducible to it." A concept that we can perceive as critique and mostly as renewal is the concept of coloniality (Anibal Quijano, 2000, Nepantla, Coloniality of power, eurocentrism and Latin America ). Issued from the think tank of the group "modernity/coloniality" (es:Grupo modernidad/colonialidad) in Latin America, it re-uses the concept of world working division and core/periphery system in its system of coloniality. But criticizing the "core-centric" origin of World-system and its only economical development, "coloniality" allows further conception of how power still processes in a colonial way over worldwide populations (Ramon Grosfogel, "the epistemic decolonial turn" 2007 ):" by "colonial situations" I mean the cultural, political, sexual, spiritual, epistemic and economic oppression/exploitation of subordinate racialized/ethnic groups by dominant racialized/ethnic groups with or without the existence of colonial administration". Coloniality covers, so far, several fields such as coloniality of gender (Maria Lugones), coloniality of "being" (Maldonado Torres), coloniality of knowledge (Walter Mignolo) and Coloniality of power (Anibal Quijano). Other new developments include the consequences of the dissolution of the Soviet Union, the roles of gender and the culture, studies of slavery and incorporation of new regions into the world system and the precapitalist world systems. Arguably, the greatest source of renewal in world-systems analysis since 2000 has been the synthesis of world-system and environmental approaches. Key figures in the "greening" of world-systems analysis include Minqi Li, Jason W. Moore, Andreas Malm, Stephen Bunker, Alf Hornborg, and Richard York. Andre Gunder Frank goes further and claims that a global world system that includes Asia, Europe and Africa has existed since the 4th millennium BCE. The centre of this system was in Asia, specifically China. Andrey Korotayev goes even further than Frank and dates the beginning of the world system formation to the 10th millennium BCE and connects it with the start of the Neolithic Revolution in the Middle East. According to him, the centre of this system was originally in Western Asia. Edythe E. Weeks asserts the proposition that it may be possible to consider, and apply critical insights, to prevent future patterns from emerging in ways to repeat outcomes harmful to humanity. (See Outer Space Development, Space Law and International Relations: A Method for Elucidating Seeds (Cambridge Scholars Publishing, 2012)). Her current research, as a Fulbright Specialist, further suggests that new territories such as the Antarctic Peninsula, Antarctica, the Arctic and various regions of outer space, including low Earth orbit, the geostationary orbit, Near Earth orbit are currently in the process of colonization. By applying lessons learned from our past, we can change the future towards a direction less likely to be widely criticized. ^ Wallerstein, Immanuel Maurice (2004). World-systems analysis: An introduction. Duke University Press. pp. 23–24. ^ Wallerstein, Immanuel (1992). "The West, Capitalism, and the Modern World-System", Review 15 (4), 561-619; also Wallerstein, The Modern World-System I, chapter one; Moore, Jason W. (2003) "The Modern World-System as Environmental History? Ecology and the rise of Capitalism," Theory & Society 32(3), 307–377. ^ Wallerstein, Immanuel. 2004. The Uncertainties of Knowledge. Philadelphia: Temple University Press. ^ So, Alvin Y. (1990). Social Change and Development: Modernization, Dependency, and World-Systems Theory. Newbury Park, London and New Delhi: Sage Publications. pp. 169–199. ^ Wallerstein, Immanuel. 2004. 2004a. "World-Systems Analysis." In World System History: Encyclopedia of Life Support Systems, edited by George Modelski. Oxford: UNESCO/EOLSS Publishers, http://www.eolss.net. ^ Wallerstein, The Uncertainties of Knowledge, p. 62. ^ Wallerstein, Immanuel. 1991. "Beyond Annales," Radical History Review, no. 49, p. 14. ^ Wallerstein, Immanuel. 1995. "What Are We Bounding, and Whom, When We Bound Social Research?" Social Research 62(4):839–856. ^ Moore, Jason W. 2011. 2011. "Ecology, Capital, and the Nature of Our Times: Accumulation & Crisis in the Capitalist World-Ecology," Journal of World-Systems Analysis 17(1), 108-147, "Archived copy". Archived from the original on 2011-05-10. Retrieved 2011-02-11. CS1 maint: Archived copy as title (link). ^ Kondratieff Waves in the World System Perspective. Kondratieff Waves. Dimensions and Perspectives at the Dawn of the 21st Century / Ed. by Leonid E. Grinin, Tessaleno C. Devezas, and Andrey V. Korotayev. Volgograd: Uchitel, 2012. P. 23–64. ^ Wallerstein, Immanuel (1983). Historical Capitalism. London: Verso. ^ Hopkins, Terence K., and Immanuel Wallerstein, coordinators (1996). The Age of Transition. London: Zed Books. ^ a b c Wallerstein, Immanuel Maurice. "The Modern World System as a Capitalist World-Economy." World-Systems Analysis: An Introduction. Durham: Duke UP, 2004. 23-30. Print. ^ a b c Chirot, Daniel. 1986. Social Change in the Modern Era. New York: Harcourt Brace Jovanovich. ^ a b Wallerstein, Immanuel. 1980. 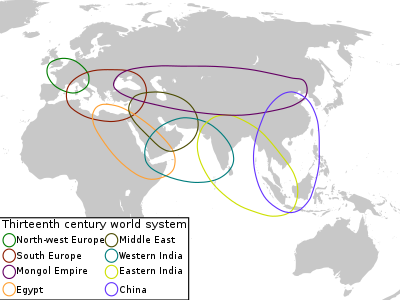 The Modern World System II: Mercantilism and the Consolidation of the European World-Economy, 1600-1750. New York: Academic Press. ^ a b c d e f g Kennedy, Paul. 1987. The Rise and Fall of the Great Powers: Economic Change and Military Conflict From 1500 to 2000. New York: Random House. ^ a b Chirot, Daniel. 1977. Social Change in the Twentieth Century. New York: Harcourt Brace Jovanovich. ^ Morales Ruvalcaba, Daniel Efrén (11 September 2013). "INSIDE THE BRIC: ANALYSIS OF THE SEMIPERIPHERAL NATURE OF BRAZIL, RUSSIA, INDIA AND CHINA". Austral: Brazilian Journal of Strategy & International Relations (in Spanish). 2 (4). ISSN 2238-6912. ^ Wallerstein, Immanuel. 1974. The Modern World System: Capitalist Agriculture and the Origins of the European World-Economy in the 16th Century. New York: Academic Press. ^ a b c Robinson, William I. (2011-11-01). "Globalization and the sociology of Immanuel Wallerstein: A critical appraisal". International Sociology. 26 (6): 723–745. doi:10.1177/0268580910393372. ISSN 0268-5809. ^ a b c d Jan Nederveen Pieterse, A Critique of World System Theory, in International Sociology, Volume 3, Issue no. 3, 1988. ^ "Quijano, 2000, Nepantla, Coloniality of power, eurocentrism and Latin America" (PDF). unc.edu. ^ "M. Lugones, coloniality of gender, 2008" (PDF). duke.edu. ^ Abu-Lugod, Janet (1989), "Before European Hegemony: The World System A.D. 1250-1350"
^ Korotayev A. A Compact Macromodel of World System Evolution // Journal of World-Systems Research 11 (2005): 79–93 Archived 2009-07-06 at the Wayback Machine; Korotayev A., Malkov A., Khaltourina D. (2006). Introduction to Social Macrodynamics: Compact Macromodels of the World System Growth. Moscow: KomKniga. ISBN 5-484-00414-4; Korotayev A. The World System urbanization dynamics. History & Mathematics: Historical Dynamics and Development of Complex Societies. Edited by Peter Turchin, Leonid Grinin, Andrey Korotayev, and Victor C. de Munck. Moscow: KomKniga, 2006. ISBN 5-484-01002-0. P. 44-62. For a detailed mathematical analysis of the issue, see A Compact Mathematical Model of the World System Economic and Demographic Growth. Grinin, L., Korotayev, A. and Tausch A. (2016) Economic Cycles, Crises, and the Global Periphery. Springer International Publishing, Heidelberg, New York, Dordrecht, London, ISBN 978-3-319-17780-9.